The Catalan crisis, which kept Spain on edge for a few months last year, appears to have been laid to rest. Whether it’s once and for all or until next time remains to be seen. Carles Puigdemont, the ousted president of the Catalonia region, said in a series of text messages that were filmed and published by broadcaster Telecinco this week, that the fight for independence was over and that his fellow politicians had sacrificed him and his former cabinet members (who had fled with him to Brussels last year to avoid arrest). “Moncloa’s plan has triumphed,” he said in the messages, referring to the Palace of Moncloa, the official residence of Spanish conservative Prime Minister Mariano Rajoy, adding that they were “again living through the final days of a Republican Catalonia”. 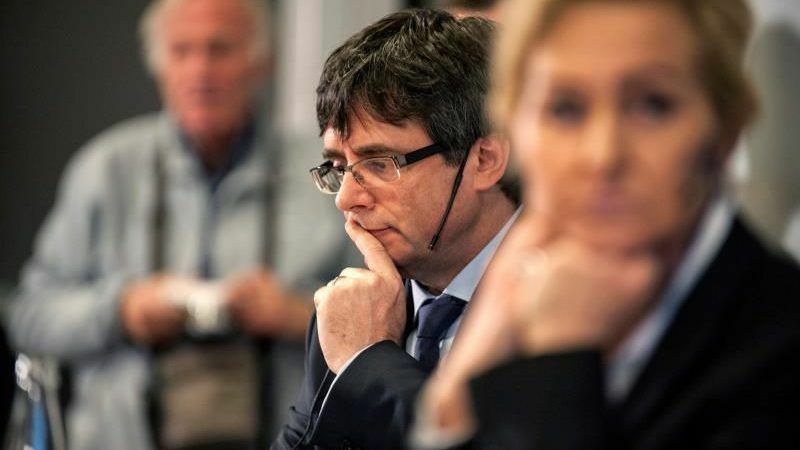 Puigdemont is currently in Brussels to avoid arrest in Spain for his involvement in a separatist referendum and the subsequent unilateral declaration of independence – which Madrid overturned before dissolving the regional government. Once the messages were unveiled, Puigdemont tweeted that he was only human and had moments of doubt but would continue fighting for Catalonia’s independence but, by that time, the world no longer cared. There remains, however, one more snag to keep an eye on. Puigdemont is fighting to be allowed to become president of Catalonia again, after pro-independence parties won a slim majority in the December election called by Madrid and unanimously elected him to head the chamber. But that would mean taking the oath remotely, as Puigdemont knows he would be seized by the police the moment he sets foot in Spain. The Madrid government, for its part, insists he must attend the inaugural session in Barcelona in person. The session, originally planned for this week, has been delayed as the Spanish Constitutional Court is looking into the pleas from Catalonia to allow Puigdemont’s virtual attendance. With Catalonia now a paper tiger [despite the more than 50,000 supporters who turned out in Brussels to show support in December], Europe’s other trouble spots may get more attention. After the tectonic shift that the UK’s departure will cause next year, one may well wonder ‘whither Scotland’? Nicola Sturgeon has been urged by her colleagues to delay a second Scottish independence referendum (after the failed one in 2014) until the early 2020s, and focus instead on Brexit and domestic policy. Outside the EU, it’s even more interesting as it becomes increasingly apparent that Serbia may be allowed to join the bloc in 2025 (at the earliest) without formally recognising Kosovo, its former province which declared independence in 2008. A compromise deal seems to be a legally binding document adopted by Belgrade which regulates full normalisation between the two but stops short of saying ‘we recognise Kosovo’. It may just be the way to go. Can you really demand that Serbia swallow its pride if five EU member states, including Spain, have not recognised Kosovo? Two of those five, Greece and Cyprus, are obviously worried about the Turkish-controlled part of the eastern Mediterranean island. Slovakia’s official position was that Kosovo’s independence was a unilateral act not in compliance with international law. In reality, it was about discouraging any hypothetical aspirations of its Hungarian minority (10% of the population living in southern Slovakia), who are courted by Viktor Orban, given the dual citizenship and the right to vote in Hungarian elections. The EU is obviously not a panacea for all regional problems. All the more reason to make sure it plays its cards right when it comes to rethinking regional policies and funding after Brexit. Europe interconnected. Town twinning created a range of trans-European city partnerships, helping the continent come together in the decades following World War Two, a study finds. Accession disappointment. Bulgarian Prime Minister Boyko Borissov used the Brussels launch of the Bulgarian EU Presidency to denounce those EU countries that have prevented his country from joining the Schengen zone. No dialogue, no membership. Parliament President Antonio Tajani said in the Serbian capital that a legally binding document regulating relations between Belgrade and Pristina, as well as continued dialogue with Kosovo, is needed before Serbia joins the EU. Nuclear option. Parliament’s justice committee voted in favour of launching Article 7 against Poland and the resolution adopted will be put to vote at an upcoming plenary sessions. Poles divided. Polish citizens are divided over whether Article 7 is justified, with nearly half of them believing that the Commission is just acting because it does not like the current authorities in Warsaw. Subsidies allies. Romania backs Poland in its rejection of proposals to tie future EU subsidies to member states’ adherence to the rule of law. Judicial overhaul. Romania’s President Klaus Iohannis said he would fight for the independence of his country’s courts, which he and Brussels say is threatened by draft laws prepared by the Social Democrat-led government. Quota for easy access. The Czech government agreed to double the number of Ukrainians it was allowing in as fast-track migrant workers, aiming to help firms struggling to find workers and facing pressure from the workforce for wage hikes. Building bridges. The Austrian government announced it wants to fulfil a “bridging function” within the EU between the Visegrad states and Western Europe. Swiss-EU relations. Switzerland will not meet the Commission’s upcoming deadline for a deal on a new treaty that would bind the neutral country more closely to its biggest trading partner. Bad loser. Italy will appeal to the European Court of Justice against the decision to move the bloc’s medicines agency to the Netherlands after Milan lost its bid against Amsterdam. Funding despite Brexit? Italy wants co-funded resources of the EU’s cohesion policy to remain unchanged under the new budget after 2020 and to be managed by the regions. Cheese row. The Commission has warned Copenhagen to enforce protection of the protected designation of origin ‘feta’, following information that Danish companies export the product outside the EU with misleading labelling.